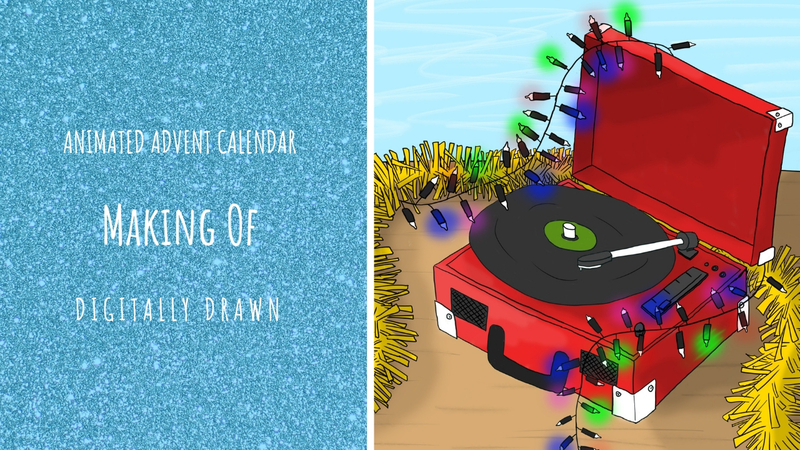 I was thoroughly looking forward to this holiday for months to say the least, after a lot of work and things going on in the busy day-to-day of life, the thought of a holiday at the end of it was getting me through the longer days. This family holiday to Portugal for a week and a half with three days in Lisbon and the fourth traveling over to Lagos for a week there that we had booked originally. 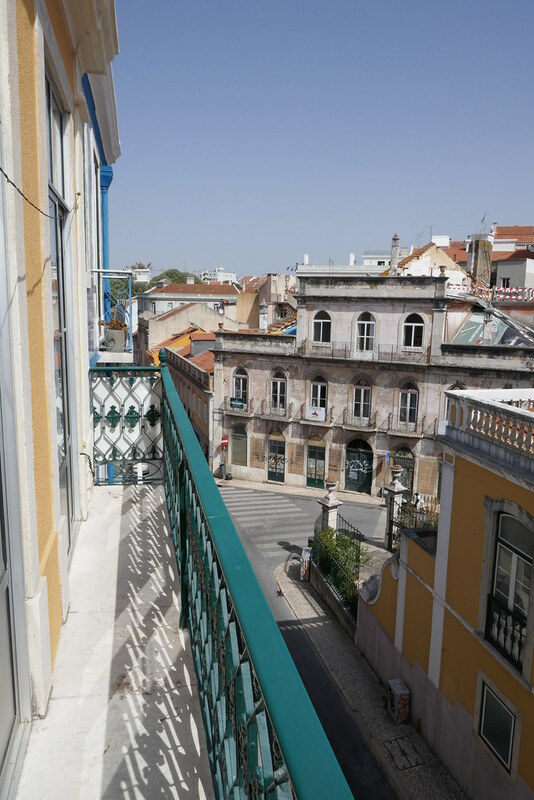 We had decided to go to Lisbon for a couple of days to get in some more busy ‘tourist’ like days seeing the sights and the things on offer in this more busy town like place of the area in Portugal, while still having the more relaxing do-nothing time in Lagos for the week after.. So over the next few weeks I shall be going through the experiences and visits Portugal had to offer this trip – so stay tuned! Making our way [thankfully not too obscenely an hour] to London Gatwick for the flight to Lisbon Airport was my first time trying out the new self-check in with the luggage, very strange to be sending something off into a machine in the hopes it will be there at the other end again. But hey! No worries there as it made it safe and sound! Also saved a huge amount of waiting around that you would normally get at this stage of the journey which is cool. The rest of the airport journey was simple enough and we grabbed a bunch of food at WHSmith before the flight to save a little extra there. We flew with easyJet and as usual I had the window seat and enjoyed the chance to play around photographing out the window. And trying out newly discovered apps on my phone, such as the hyperlapse to show a quick edit of a longer chunk of footage or boomerang with a quick forward backward loop of an shot repeated a few times. These with the unique views of plane flight made for some interesting little films and experiments. Stepping into Portugal we were greeted with the wonderful warmth of the hot holiday weather that I personally as the generally feeling cold human being adore. The bags were easy to collect up and then we were on our way, on the exciting underground journey through the Metro to the apartment we rented in Rato. I was nervous at first using public transport in a foreign country but with my parents levelheadedness and my good map reading skills it was actually pretty easy to use. 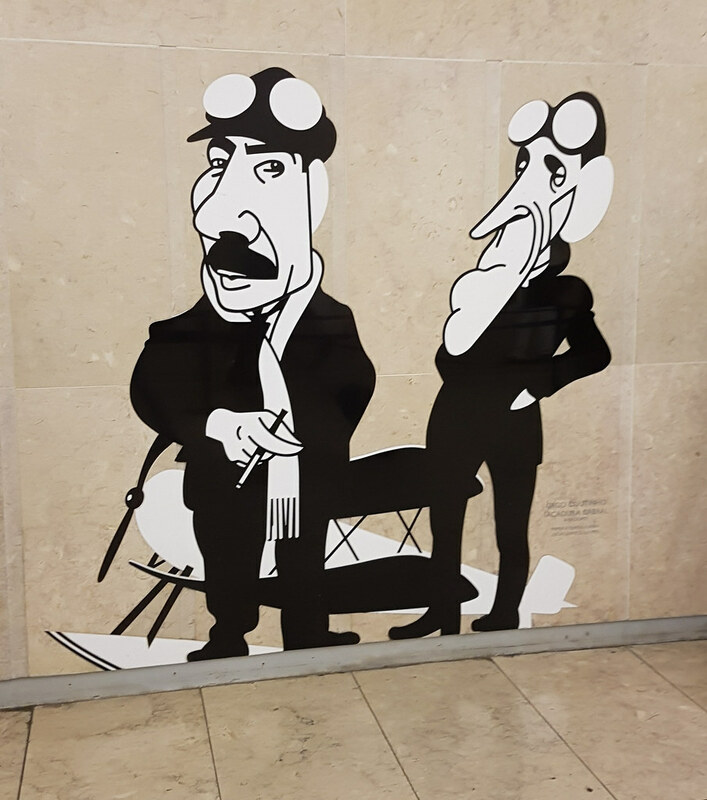 I loved the entrance we got on at with these great caricature designs of famous people decorating the walls. Then stepping out of the station we hit this great wave of heat that can only be described like being in front of a warm fire, but all around you, something I had never experienced before. Being especially awkward dragging along a suitcase. Thankfully the apartment was right up the road from the underground and so made for a swift journey. The apartment itself was this lovely little place with some great space to it in a really interesting layout with the corridor to the kitchen, bathroom, main bedroom and living room. And then from the living room you get the two other bedroom spaces and a balcony with another balcony out of the smaller bedroom. It has such a great ‘on holiday abroad’ kind of feel to it with the architecture: the shutters to the windows, the thin width solid crafted wood doors and brass peep holes and locks to the front door that triple lock. All in all the space was wonderful with all the amenities wanted such as TV and Wifi but also such a lovely space to really get ones creative juices flowing in a beautiful city. The only downside being no air con – BUT we had plenty of fans to make up for this. A truly great stay choice in Lisbon. To top off our first night’s stay in this trip I looked up the local cuisine and found a really interesting looking spot – A Cevicheria. After an easy enough fifteen minute walk we found this fantastic little spot with great bold cutout black metal bird shapes to the openings in the walls that greet you. We got one of the house special drinks while we waited on a table, a very refreshing concoction that made the wait pass in no time. 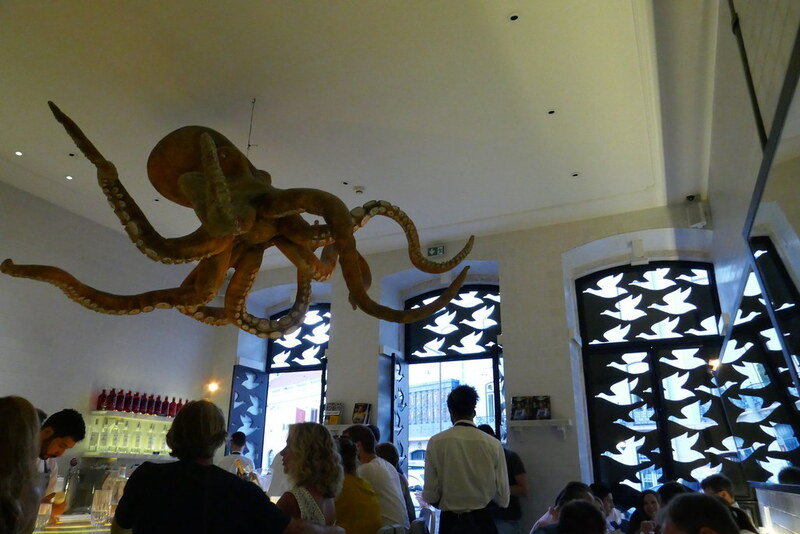 Inside the restaurant was just as eye catching and bold with this snazzy bright tiled floor [traditional look of Portugal which I love] and the centerpiece of this giant octopus hanging from the ceiling which is hard to miss even from the outside. And then came of course the meal. This is like a tapas place where you pick a series of dishes rather than one to yourself. We as a family selected all those that stood out to us and my top three favourites you can see here – The BBQ Octopus Causa [Causa De Polvo BBQ] with this perfectly cooked Octopus partnered with this really lovely black mashed potato and other ingredients was something we could eat all day. 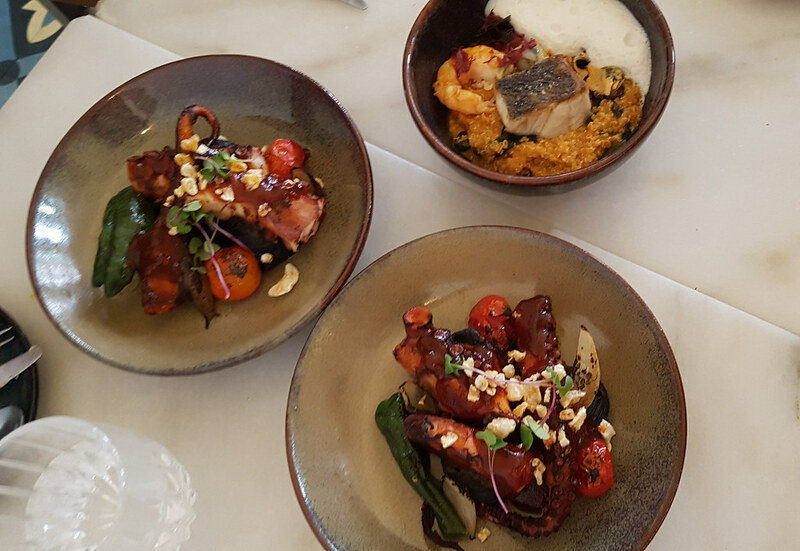 The Sea Quinoto [Quinoto Do Mar] with these gorgeous textures of the Quinoa, matched up with these great flavours of seafood. 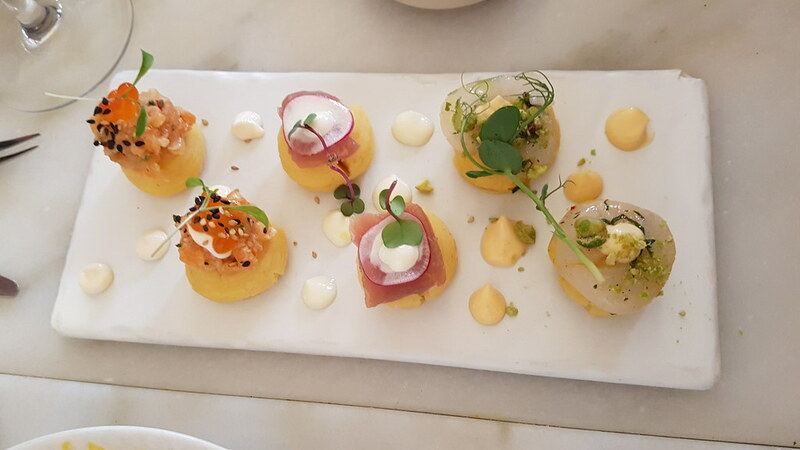 And the Mixed Causa [Causa Mista] a selection of small pieces, each with mashed potato bottoms and different fish on top, another mix of great flavours I had never tried before. This and the great service by all those within made for a fantastic first night out in Portugal and a first restaurant experience on this trip. 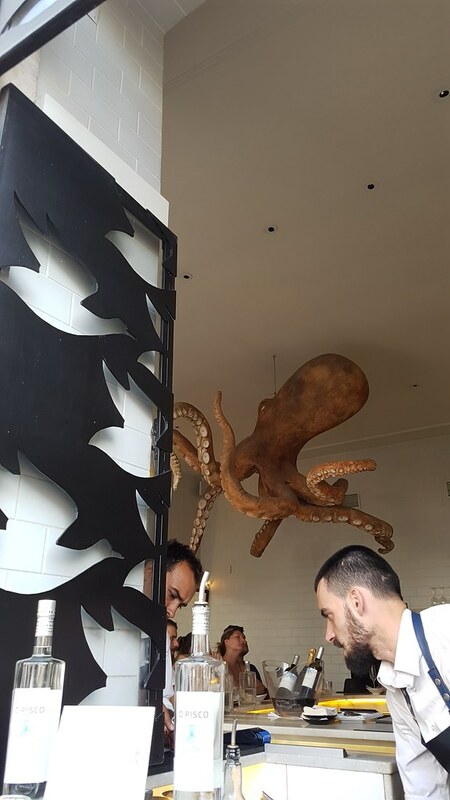 I would definitely recommend that if you are making a trip to Lisbon you Have to try go to this restaurant, especially if you like seafood like we do!